Champagne d'Argent. 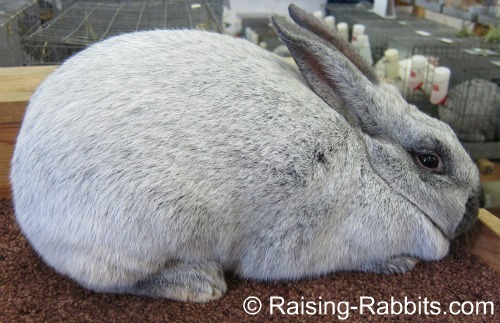 This beautifully silvered rabbit breed provides the foundation genetics for related breeds, such as the Argente Bleu, Argente Brun, Argente Crème, and Argente St. Hubert. While not the oldest breed ever, the Champagne d’Argent is recognizable in history clear back to 1631. Undoubtedly the breed predates this reference by untold years. "For the richnesse of the skin, that is accounted the richest which hath the equallest mixture of blacke and white haire together, yet the blacke rather shadowing the white; the furre should be thicke, deepe, smooth, and shining..."
Yep, perfect description of the Champagne d'Argent. France’s Encyclopaedia of Science, dated 1765, describes a silvered rabbit such as the Champagne d’Argent and the Argente Brun, but under the name of a Riche Rabbit, possibly because, again in the ancient words of Marrkham, "When another skin is worth two or three pence, they are worth two shillings." Champagnes first arrived in the USA in 1912 under the name of Champagne or French Silver. The Champagne d’Argent Rabbit Federation formed in 1932. In the UK, the breed is known as Argente de Champagne. Champagne d’Argent rabbits are born pitch black. It is not until their first junior coat, at around 7-8 weeks old, that the silvering effect begins to show itself. As the new coat begins to come in, the "secondary" guard hairs are white-tipped. 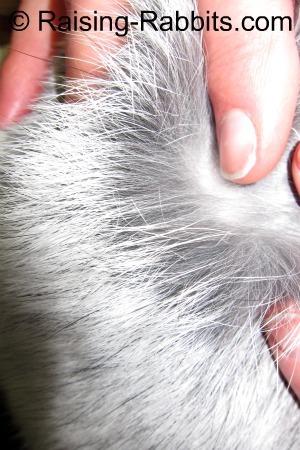 The "primary" guard hairs and the undercoat, however, are still fully pigmented. The effect this gives is that of "old silver." The darkness of the still-pigmented guard hairs and the undercoat, where they show through, "tarnishes" the overall silveriness of the rabbit. This is very striking and attractive, and is the reason why over the ages, the pelt of the rabbit we know today as the Champagne d'Argent commanded huge premiums over the value of a standard rabbit pelt. With each successive molt, more of the pigment is lost, extending even to the primary guard hairs and the undercoat, although we’ve never seen a Champagne d'Argent that looks completely white. The degree of silvering is heritable. 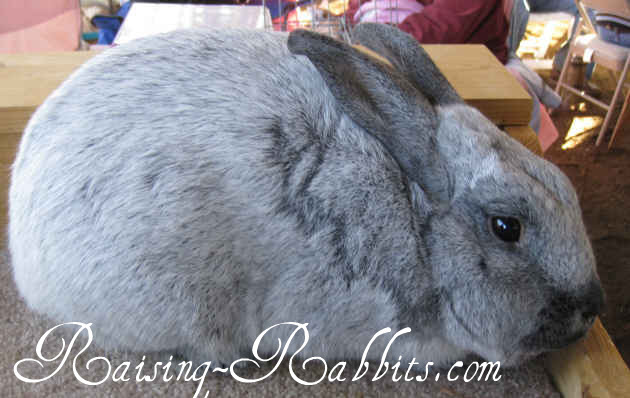 The Silver rabbit, and the Silver Fox rabbit are both silvered breeds, examples of minor silvering. Your purchase is 100% Risk Free. See our Double-Value Guarantee below. The French like their Argente de Champagnes fifty-fifty, or moderately silvered, while breeders in Belgium prefer heavily silvered Champagne d'Argent rabbits. In fact, they could not compete fairly in European shows due to the fact that their Argente de Champagnes didn't correctly match the official French standard. But no problem. 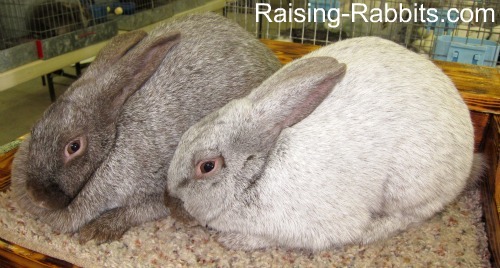 They renamed their rabbits Belgian Silvers, and wrote a new standard for the "new" breed. Go to this Champagne d'Argent Facebook page for some additional great pictures of Champagne d'Argents. The Argente de Champagne of the UK weighs approximately 3.62 kg (8 pounds). Its coat is at least an inch long, and glossy and dense. The density causes the coat to not lay flat, meaning you can see through the silvering to the shadowy dark underfur. In the words of the BRC Standard of Excellence, the coat color gives the effect of "old silver." The Champagne d’Argent in the USA is a substantially larger animal, tipping the scales at up to 12 pounds. It exemplifies a commercial, meat rabbit type, being full in the shoulders and deep in the hindquarters. The Argente Noir, being of a black undercolor, seems to differ from the Champagne d’Argent in size only. The Argente St. Hubert is a black agouti-based rabbit. Parting the hairs on the silvered pelt reveals grey near the skin, a rich orange or rufous ring and black tips on those hair shafts that have not lost their pigment. The Argente Crème is the UK’s small version of the Crème d’Argent in the USA. The rabbits are very similar as to silvering and color, however the main difference between the continents is size. Argente Crèmes should weigh a petite 2.26 kg (5 pounds), while the Crème d’Argent in the USA weighs in at up to 11 pounds (5 kg). In the United States, they have commercial meat rabbit bodies with the delicious creamed orange color - "creamy white with an orange cast carried throughout" (ARBA Standard of Perfection). Find the UK Breed Standard of excellence at the BRC. Two Argente Bruns with different rates of silvering. The rabbit on the left more closely approximates the US standard of perfection. Argente Brun rabbits became the 49th rabbit breed in the USA as of February 1, 2016, after the third showing of the Argente Brun was accepted at the 2015 ARBA National Convention. Senior Bucks should weigh 8-10 pounds; senior does should weigh 8.5 - 10.5 pounds. Color should reveal moderate, even silvering over a chocolate rabbit, with slightly darker muzzle and ears. The full standard of perfection is available through the ARBA. 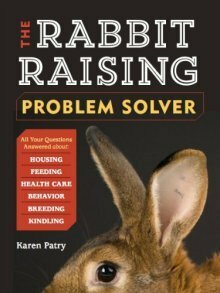 Is This Your Rabbit Breed? 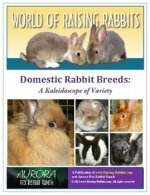 Do you have a great story or experience with this breed of rabbits? Feel free to share it! And while you're at it, you can include up to four photos.